Ben Steffans was born in Detroit, Michigan, and raised there and in Cedar Rapids, Iowa. As a youth, Ben Steffans enjoyed playing nearly all sports, eventually focusing on soccer and having the opportunity to play soccer throughout Europe and in Brazil. Ben Steffans graduated from Michigan State University in 2003 with highest honors and with degrees in History and Latin. He graduated from Boston College Law School in 2006. Ben Steffans is admitted to practice law in the Massachusetts Bar, New York Bar, and Michigan Bar. Prior to practicing law, Ben Steffans held a number of jobs, including waiting tables (Chili’s and Macaroni Grill), shelving books in a book warehouse, selling books in a bookstore, and working in a pizza restaurant. In 2006, Ben Steffans began practicing law at Butzel Long in Detroit, Michigan, a large international law firm. During his time at Butzel, Ben Steffans focused solely on employment law, learning how to defend employment claims and advise employers from some of the country’s best employment lawyers. While at Butzel, Ben Steffans represented only employers in employment disputes, focusing on those in the automotive, retail, manufacturing, educational, financial, and construction fields. During that time, Ben wrote countless employee handbooks, employment contracts, employment policies, and non-compete agreements for employers of all sizes. He also provided day-to-day counseling for those clients on how to comply with state and federal employment laws. In 2011, Ben Steffans founded Detroit City Football Club along with four friends. DCFC plays semi-professional soccer in Detroit and has become the darling of the U.S. Soccer community. In 2016, DCFC averaged over 6,500 in paid attendance and reached the national semifinals of the National Premier Soccer League. In 2012, Ben Steffans began practicing law at Cohen Kinne Valicenti & Cook LLP, in Pittsfield and Worcester, again focusing almost exclusively on employment law. This time, however, Ben Steffans began primarily representing plaintiffs in employment claims against their employers. Ben used his experience representing employers to help individuals in all types of employment claims, including including harassment, wrongful termination, workplace bullying, retaliation, racial discrimination, gender discrimination, age discrimination, sexual harassment, claims for unpaid overtime, unpaid bonuses, unpaid commissions, and claims of independent contractor misclassification. In 2017, Ben Steffans started Steffans Legal so he could focus his entire practice on employment law. For Ben Steffans, being a lawyer has offered an unexpected opportunity for personal connection. Ben Steffans’s down-to-earth approach makes him easy to talk to and allows him to work closely with his clients through what are often difficult and stressful times. Ben Steffans’s clients know him to be personable, enthusiastic, funny (sometimes), tenacious (always), honest, direct, efficient, and effective. Some of them have even become close friends. In his spare time, Ben Steffans enjoys watching true crime programs, doting on his dog Elliot, and running. Ben Steffans currently is trying to run (not always fast) a half marathon in all 50 states. To date, he’s tackled Maine, Vermont, Massachusetts, Connecticut, New York, Pennsylvania, New Jersey, Delaware, Maryland, South Carolina, Georgia, Louisiana, Michigan, Texas, Oregon, Utah, Nevada, Colorado, and New Mexico. Elliot joined Steffans Legal in 2017. He joined our family in 2014. His lawyering days are behind him, but Elliot brings to the firm a depth of experience, unrivaled instincts, and an insatiable appetite. He also graciously greets visitors to the office and warmly accepts treats from their pockets. Officially, Elliot is a Royal Bahamian Potcake, which is apparently fancy-speak for 'mutt,' (but don't tell him that). Adrienne Arnold was born in Fort Worth, Texas. She was raised there and in Dallas, where she went to high school, played competitive tennis, and graduated at the top of her class. Adrienne has always had a knack for languages has spent time living in Spain, Brazil, and Peru, where she focused on learning Spanish and Portuguese. In her spare time, Adrienne enjoys hiking, practicing yoga, playing tennis, and spending as much time as possible outdoors. Adrienne graduated with honors from Boston University in 2011. 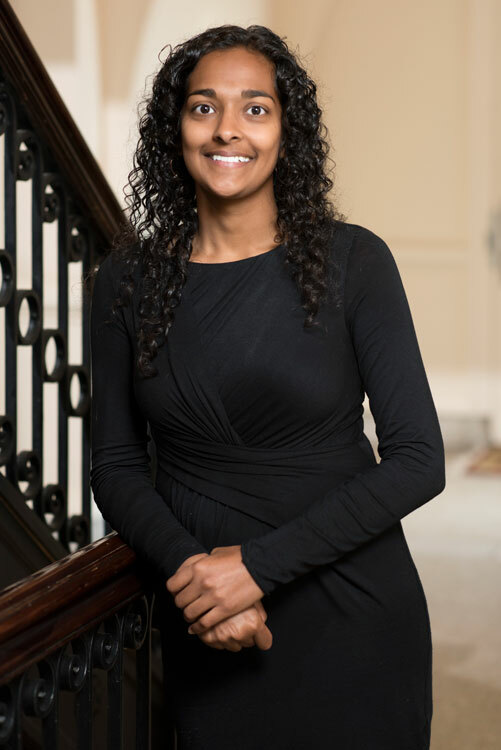 After college, she worked in Boston’s not-for-profit sector at Big Brothers Big Sisters of Massachusetts Bay and then as a legal assistant in several prestigious law firms. In 2014, she moved back to Texas to attend law school and graduated from the University of Houston Law Center in 2017. During law school, Adrienne was a Senior Articles Editor for the Houston Law Review where she published two articles. Her comment “Magistrates and Misdemeanors” received the Beck Redden Award for Best Comment Addressing Complex Litigation Issues. Adrienne spent her law school summers interning and working in various fields, including at the Executive Office of Immigration Review, the Dallas County Public Defender’s Office, the Texas Attorney General’s Office, and Reed & Scardino, LLP. Adrienne was honored to receive an invitation to return to Reed & Scardino in Austin, Texas after graduation to work as an Associate on the intellectual property litigation team. In the summer after she graduated from law school, however, Adrienne had a life-changing experience when she visited a friend in the Berkshires. Smitten with both the stunning Berkshires scenery and its charming natives, Adrienne decided to move back to New England, where she has always felt more at home. Since moving to the Berkshires, Adrienne has enjoyed living in Great Barrington and immersing herself in its vibrant community. Rodriguez, Terry, and the Supreme Court’s Evolving Fourth Amendment Jurisprudence, 6 HLRe 135 (Fall, 2015). Magistrates and Misdemeanors: Examining Magistrate Judges’ Petty Offense Jurisdiction, 54 Hous. L. Rev. 209 (Fall, 2016). Adrienne passed the Uniform Bar Exam in October 2018 and is in the process of becoming licensed in Massachusetts and New York. Adrienne joined the Steffans Legal team in September 2018. Florence J. Nightingale III joined Steffans Legal in 2018. She joined our family in 2018. Her lawyering days are all in front of her. Thankfully, she’s under the wise tutelage of our Senior Partner, Elliot. His training regimen includes complete immersion in all employment law areas, routine and unannounced pop quizzes, and courtroom decorum. His regimen also includes how to find street food, con visitors out of treats, and potty training. She’s better at some than others. Vanita Mistry was born in Rugby, England. She moved with her mom, dad, and sister to the suburbs of Pittsburgh, Pennsylvania when she was 16. After graduating from high school, Vanita enrolled at the University of Michigan. As a Brit, her memories of Michigan football games mostly include selling her season tickets and letting people park (for a fee of course) on the lawn of her rental house. Vanita graduated from Michigan with a degree in mechanical engineering. After graduating, Vanita began working for General Motors as part of its team that modeled low-speed impacts on bumpers, facies, and grills. Vanita tired of GM quickly and left after only one year to change fields entirely. From 2008-2011, Vanita worked as a community organizer in Detroit, primarily focused on early childhood education. During that same time, Vanita started Detroit Greencycle a curbside recycling and composting business operated by bicycle. For an idea of how hard Vanita works, take a look at this. A picture is worth a thousand words. In 2012, Vanita and Ben moved to the Berkshires. From 2013-2017, Vanita worked for local manufacturer, first as a customer service representative, and then as the director of their knitting department. In 2018, Vanita joined Steffans Legal where she serves as its office manager, office coordinator, supply chain manager, human resources manager, dog walker, intake coordinator, IT department, purchasing director, finance director, chief accountant, and marketing director, among other things. In her spare time, Vanita likes to work outdoors, bake, make fires, and try to stop Flo from chasing the cats.